"This is by far the best book I have ever read on pitching magic. I will be using this information to pitch to the public. Well worth the price asked for the book." "There's a lot of useful information here. I pitched Svengalis, three-card tricks and cups and sponge sets myself for many years and this is certainly a book I'd recommend to anyone who wishes to work as a magical pitchman." "Without a Doubt the most informative book I have ever read on how to Pitch and Sell Magic for Big Profits. If you cannot make yourself big money on a regular basis after reading this book then it's time for you to get a proper job!" "I had the chance to take a look at the "Perfect Pitch" book by Jonathan Royle and I have to say that I really enjoyed reading about his real life experiences studied and discussed to help improve anyone's selling skills. Loved the thinking behind the advice of using laughs and certain hypnosis techniques to get people in the right mindset of "buying". In this book you can find a lot of resources and tips on how to take your selling abilities to a better level. It got me thinking and I can't wait to try Jonathan's advices out! Good job!" "I'd definitely suggest to anyone who wants to demo Svengali deck's or is embarking upon pitching and selling magic that this book is a must-read!" Born into a circus family, Jonathan Royle made his stage debut at age 3 on Gandey's Circus and over the years worked both performing and also pitching novelty items at major exhibition centres, galas and large outdoor events all over the UK. In his former stage name of Alex-Leroy, at age 15, back in 1991 Jonathan Royle became (at the time) the youngest person ever contracted by Marvin's Magic to demonstrate their line of magic tricks and novelty items. During his time working for them, Royle was regularly at the top of the sales figures leader board, often outselling much larger stores in much busier locations. Indeed on one occasion he even sold more in one day than many of the stores were selling in an entire week. Within the information packed 53 pages of this large format (A4 Size) publication you will learn all of Royles, until now, jealously guarded secrets of exactly how to make massive profits from pitching and selling magic tricks and novelty items to the general public. You will discover all of the "Secret Sources" around the world where pitchmen obtain their stock to sell at massive profits as there is literally a directory of most every place in the world to obtain your items to sell. The true psychology of arguably "Hypnotizing" the crowd so that they are putty in your hands and highly suggestible to the idea of buying things is revealed in an eye opening manner. Secrets of how to quite literally laugh them out of their money are detailed along with examples of how this can easily be achieved. Royle reveals the exact Svengali pitch that enabled him to sell the equivalent of well over 400+ Svengali decks in a single day and has helped him to sell numerous thousands and thousands of decks during his time pitching this magical product. You will be taught every element of this routine, the psychology behind it, exactly what to say and when to say it and what to do and when to do it! 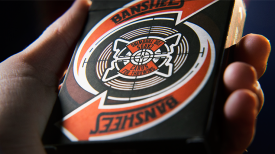 Indeed not only is this a truly powerful and profitable routine to pitch and sell Svengali decks, but Royle has used it on many occasions in the real world of performing to and entertaining the general public as it is structured to be truly magical and mystifying whilst providing true entertainment at the same time. Some elements of this Svengali pitch and routine are as he openly admits inspired by the work of the legendary Mark Lewis the author of the amazing book "The Long and the Short of it" but even Mark would have to agree that Royle has put his own unique stamp on things. You will also discover "The Lazy Man's Way to Pitch Profits" which was one of the key secrets of Royle selling so much stock during his time with Marvins Magic. Royle reveals his "Multi Purpose Crowd Attracting & Attention Getting Spiel" which can be used to attract a crowd of eager customers before you go on to sell them almost anything and everything. Discover the ridiculously simple way to make around $1,000 a day selling balloon animals and models without the need for any real skill as only the most basic and easy to use balloon figures are needed or used. The smart persons guide to making big profits from coloured hair spray and face painting. Once again next to no skill is required and this approach has regularly proven itself to be a guaranteed money spinner. Plus you'll learn what all the most commonly pitched items are, the ones that make the most profit and where to obtain them at the best prices. Plus you'll gain access to watch various online videos that will help you learn more about pitching Svengali decks, the magic mouse, squirmless aka the magic worm and numerous other low cost high profit producing items. And to help ensure your future success Royle finally reveals all of the books, audios and training videos on the subject of pitching magic and novelties that he considers to have helped himself to be successful over the years and in turn would recommend you to study as well. These additional resources are in many cases "underground" items that most magicians would have no clue existed or where to obtain them, but Royle reveals exactly where to obtain them at the lowest cost to help sky-rocket your future success. REVIEW FROM MAGICAL PITCHMAN MARK LEWIS. "Jonathan Royle aka Alex Smith is quite a character. But then you have to be a bit of a character to be in the pitch business! "I am glad that I had some influence in his success at pitching magic but he has adapted my methods to his own needs and in fact so should everyone who reads this work. "I have read his script and was struck by all the gags and selling techniques which have been used in British street markets for generations. I recognized a lot of the spiels. "Market pitchers know what they are doing and so does Jonathan. In short I recommend that you get this book." This publication is potentially worth its weight in gold to you.